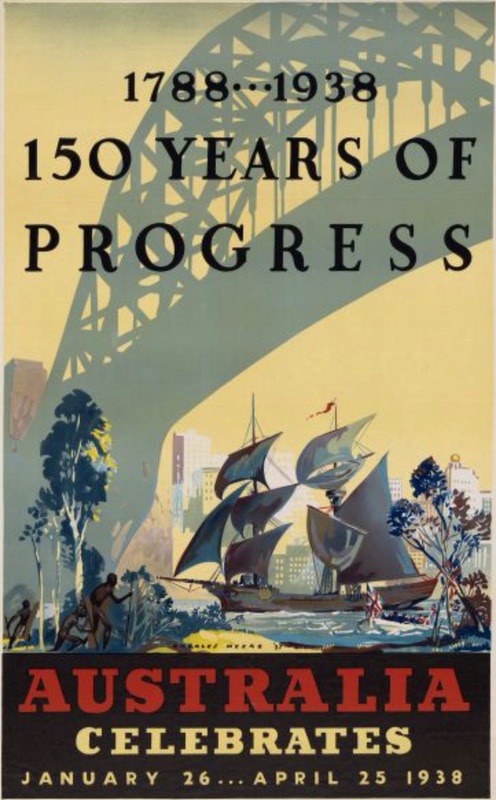 Australia Day, 26 February 1938 marked 150 years since the arrival of Governor Phillip and the First Fleet- the sesquicentenary of European settlement of Australia- ignoring the 60,000 years or thereabouts the continent has been occupied by the indigenous people of the Great Brown Land. Official celebrations throughout the country took place between 26 February and 25 April- in Albury they occurred from 12 – 19 March and comprised an athletic and cycling day on the Saturday including the Albury Gift professional sprint race, the Albury Gun Club Championship, a swimming carnival and extended to the finale on Saturday 19 March, the ‘Interstate Grand Prix’, a 150 mile (148.5 mile) handicap event for cars ‘regardless of engine capacity’. 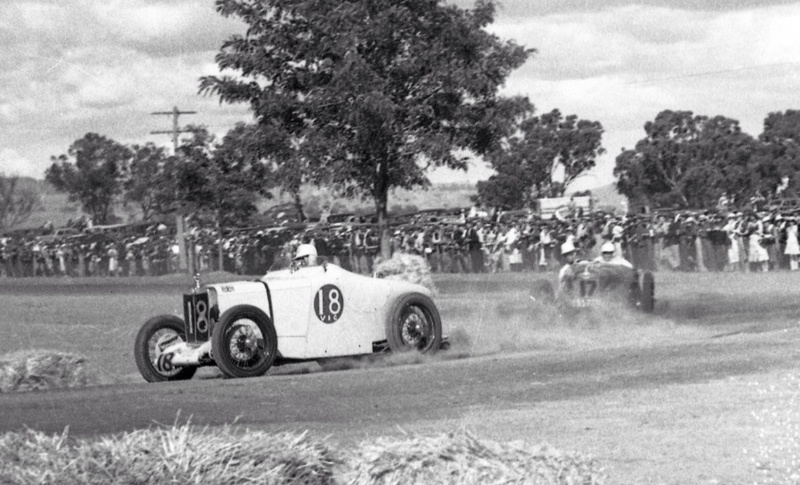 The lack of an engine capacity limit may seem not particularly notable, but the Phillip Island 1928 to 1935 ‘AGP’s had all been for cars of less than 2 litres in capacity whereas the December 1936 South Australian Centenary GP, later appropriated as an AGP, run at Victor Harbor was raced to what was effectively Formula Libre. Their was no AGP run in 1937 despite attempts to appropriate the the December 1936 event as ‘the 1937 AGP’ in the decades following. 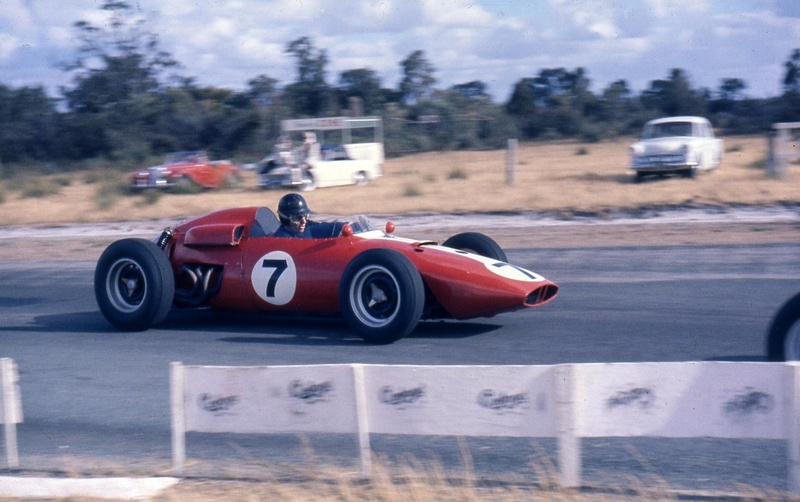 What the South Australians did, or more specifically the event organisers, the Sporting Car Club of South Australia, was to create Formula Libre as the class to which the AGP was run up to and including the 1963 event- when the Tasman 2.5 Formula succeeded it. The officials in Albury, Albury/Wodonga being the twin Murray River border towns of New South Wales and Victoria involved the Melbourne based Victorian Sporting Car Club to organise the motor-racing aspects of the celebrations. 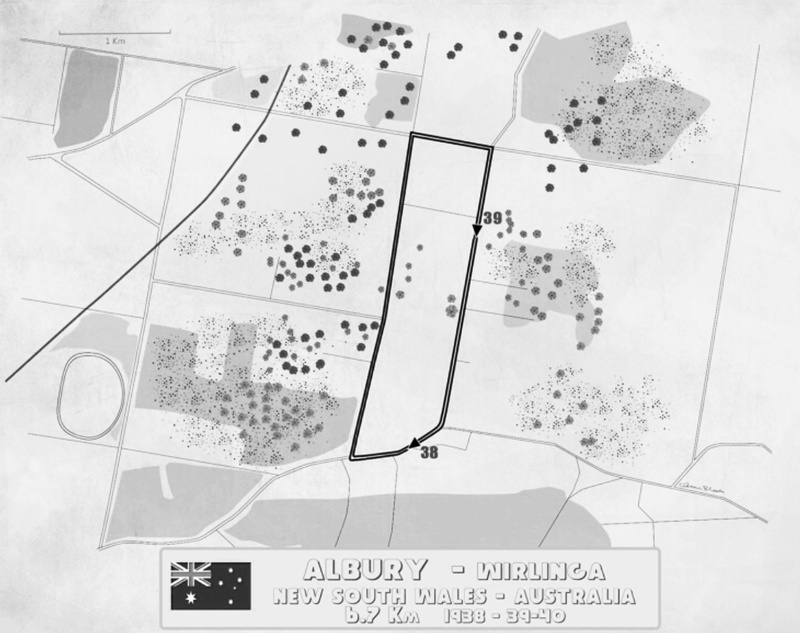 After considering various alternatives a track of 4.25 miles long was chosen by the local council and VSCC around the roads of Wirlinga, now an Albury suburb, but then 4.5 miles from Albury’s business centre. 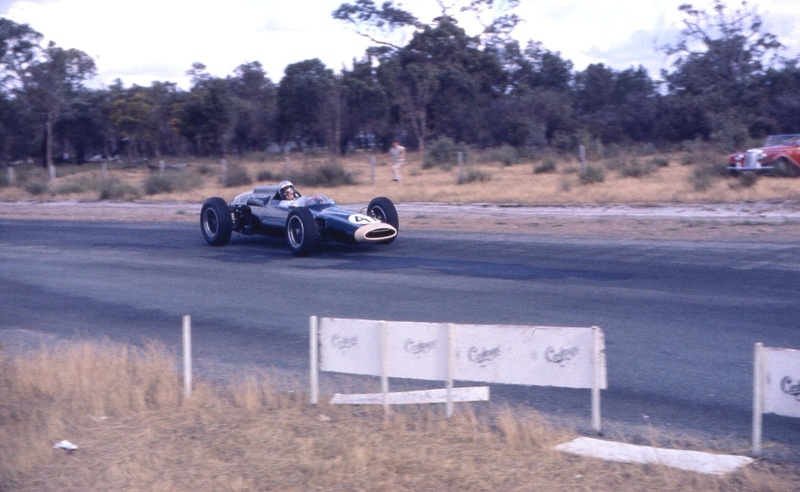 Christened the ‘Wirlinga Circuit’ it ’embraced a 1.25 mile section of the Old Sydney Road to the north-east of Albury, a ’55 chain’ section of the Livingston-Thurgoona Road and more than a mile of Orphanage Road’. This course is variously described in the newspaper accounts of the day ‘as having a good surface, the majority bitumen, and the remainder buck-shot gravel which is practically dust proof’ or ‘…half the course is macadam (broken stone of even size bound by tar or bitumen) and the other half gravel, it is being specially treated with calcium chloride to make it as free as possible of dust’. Another report described ‘The roughly rectangular course, which starts on the Hume Weir road has one straight of about 1.9 miles, another of a half a mile and a long sweeping curve of 2.1 miles in length’. 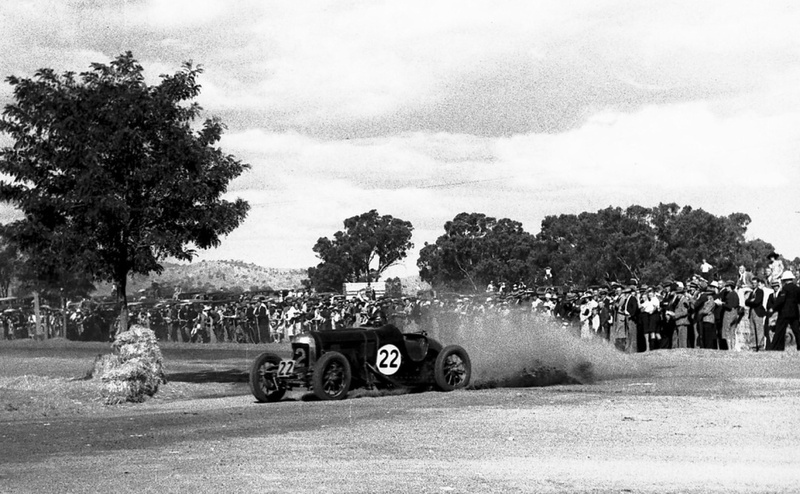 By the time of the Albury Gold Cup meeting at Wirlinga in July 1939 the entire course was bitumen surfaced. 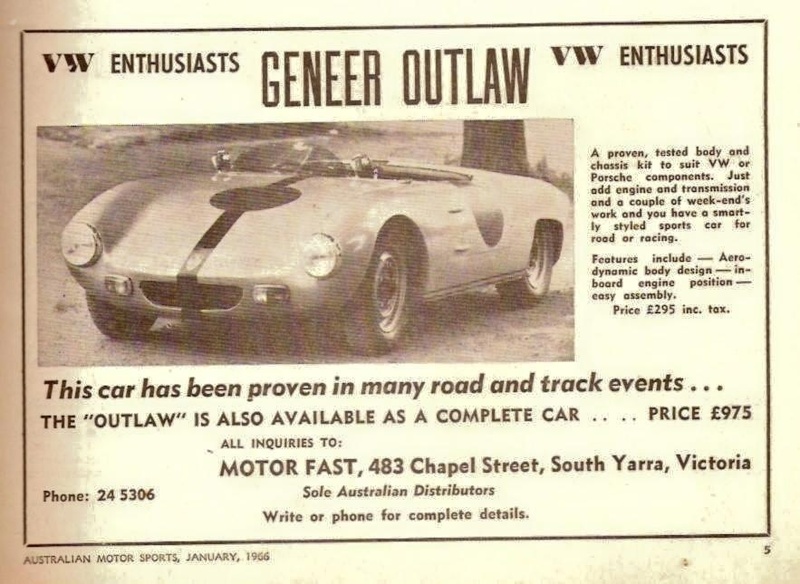 ‘This course is claimed to be one of the finest and fastest tracks in Australia’ the Melbourne Age recorded, clearly that fellow had not been to Lobethal or Mount Panorama at that point of his motor racing research/reportage! 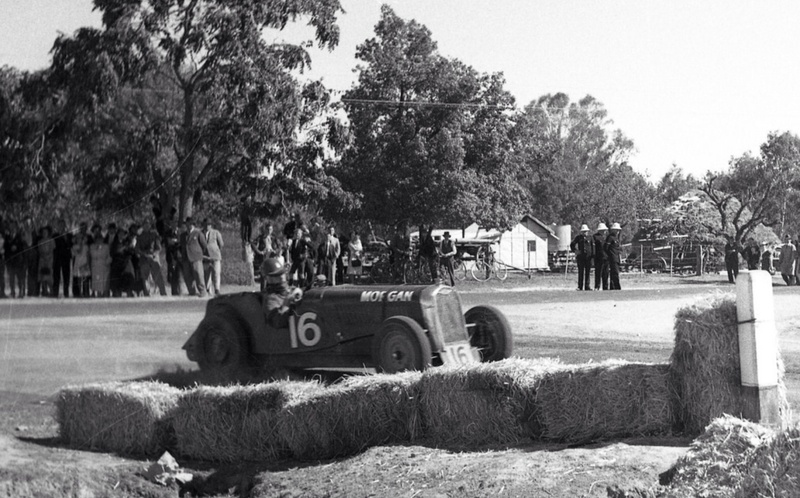 In 1938 the only Australian race tracks which were bitumen or tar were some of the ‘Round the Houses’ tracks in many country towns of Western Australia and Lobethal in the Adelaide Hills. 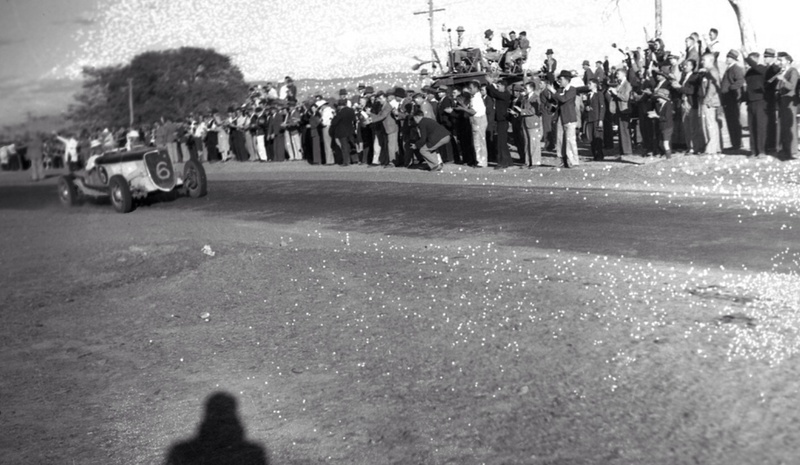 Phillip Island, the site of the early AGP’s, Victor Harbor, which held the December 26 1936 South Australian Centenary Grand Prix, and Mount Panorama, Bathurst, which held its first race meeting at Easter in 1938- all had loose gravel surfaces. 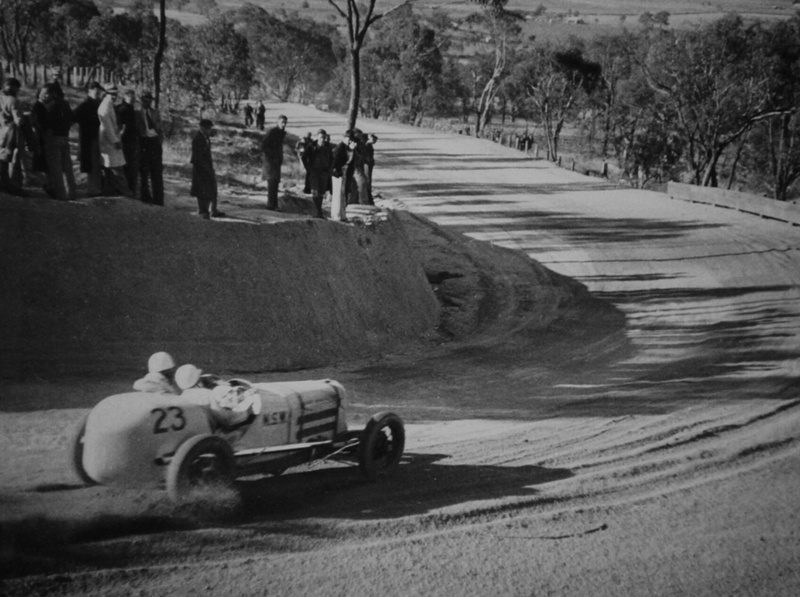 So Wirlinga, with a mix of sealed and unsealed surfaces would present challenges to the drivers- many of whom were unfamiliar with a solid surface like bitumen with the exception of those who had raced on the Maroubra concrete bowl or the opening January 1938 Lobethal meeting several months before. Such drivers included Hope Bartlett, Bob Lea-Wright, Colin Dunne, Jim Boughton, Alf Barrett, Tim Joshua, Harry Beith, Arthur Beasley and A Aitken and perhaps one or two others. As the big weekend approached the Victorian Sporting Car Club ran a rally to Albury on the weekend of the 5th and 6th of March in which the clubs office-bearers, together with competitors and their friends journeyed the 325 Km up the Hume Highway to inspect the course- ‘which the club found had undergone considerable improvement. The bends of the track will need more attention and this will be given as suggested by officials’. A meeting of competitors, mechanics and club officials was held in the VSCC’s clubrooms at 395 Elizabeth Street, Melbourne on Thursday 17 March at 5pm before the ‘circus’ left town for Albury/Wodonga, no doubt plenty of eager competitors were already in the border towns by the time this meeting took place. Practice was to be held on the day before the race from 7 am with entry prices set at 2 shillings and a similar amount charged for a seat in the ‘huge grandstand’ (of which I cannot find a picture). Prize money totalled 300 pounds- 100 pounds was for the winner, the balance was paid down to eighth place. Whilst the important track logistics were taking place in the lead up months to the meeting, the Victorian Sporting Car Club set about getting as healthy a national entry of cars as was possible for the blue-riband event. 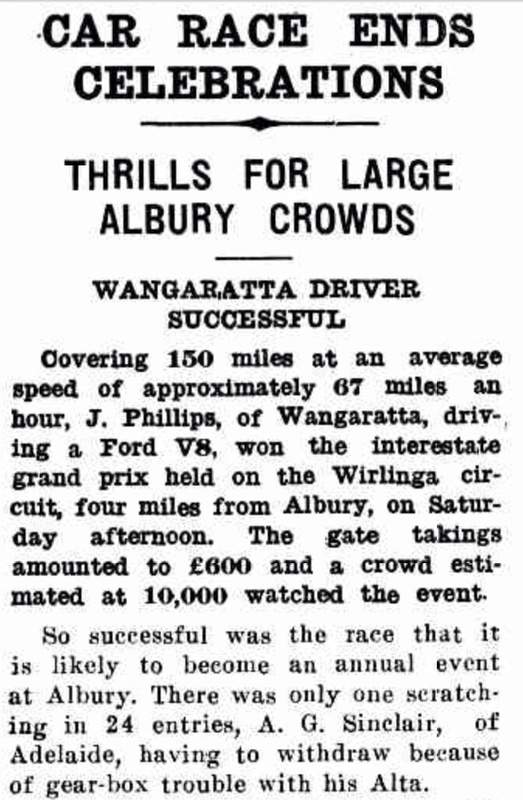 Whilst a good field of cars was entered, perhaps the proximity of the 18 April Easter Bathurst AGP to Wirlinga was a barrier to some competitors racing for fear of damaging their mount before the Mount Panorama meeting. Many of the fast guys of the period entered, perhaps the ‘headline act’ was British mystery man, racer throughout Australia in 1938/9 and MI5 spy Allan Sinclair in a supercharged 1100cc Alta. This car was a fizzer at Lobethal in January with a better showing expected- but not delivered in Albury, or pretty much anywhere else he raced with the exception of Rob Roy Hillclimb in Victoria. 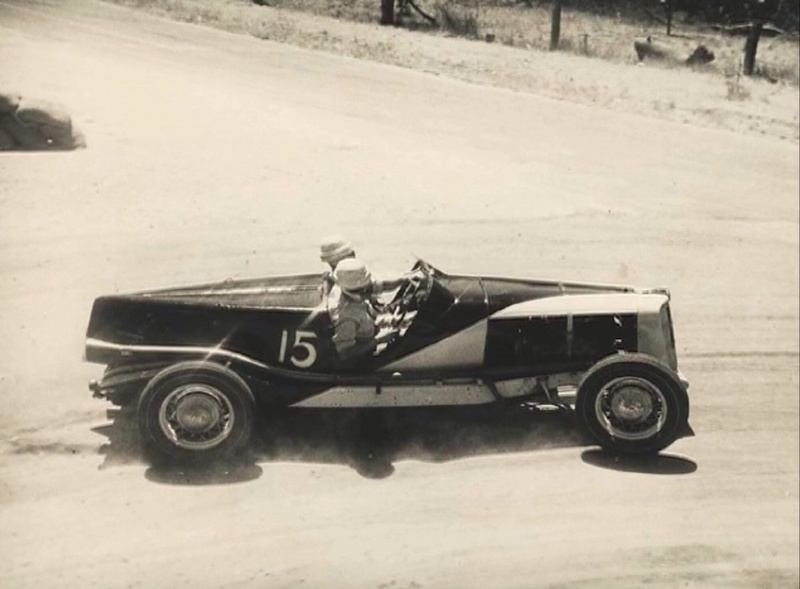 Maroubra Speedway Ace Hope Bartlett entered an MG Q Type, 1934 Australian Grand Prix winner Bob Lea-Wright- and then current VSCC President raced a Terraplane 8 Special with Frank Kleinig certain to be a front-runner in Bill MacIntyre’s Hudson 8 Special. Both these cars were powered by modified variants of side-valve straight-eights manufactured by the US Hudson/Terraplane companies. 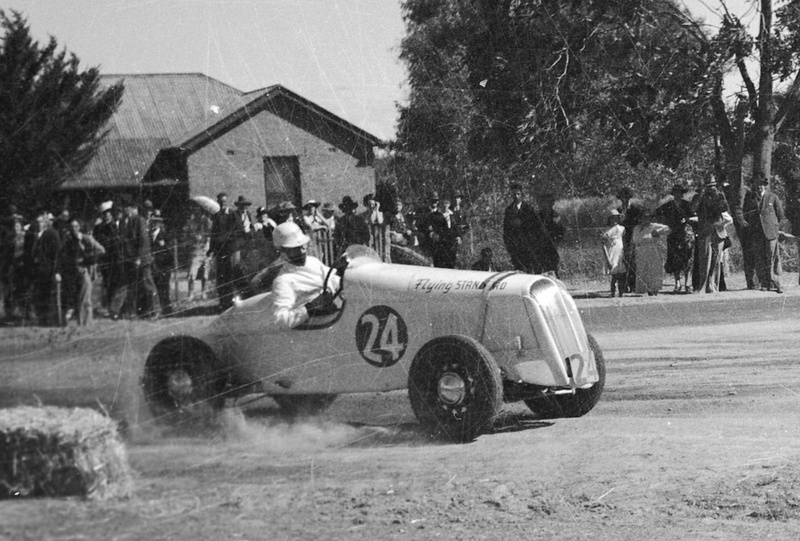 Its interesting to look at Kleinig’s car as it was at Wirlinga and the huge amount of work it took to to turn it into an ‘outright racer’ by the time of the 1939 AGP at Lobethal less than twelve months hence. Alf Barrett was entered in his Morris Cowley Spl but very shortly thereafter acquired an Alfa Romeo Monza, and it was his performances with that car which shot him to fame- by the time of the January 1939 AGP he was pretty much ‘the man’ despite one or two others racing faster cars such as Jack Saywell, Alfa Tipo B/P3. 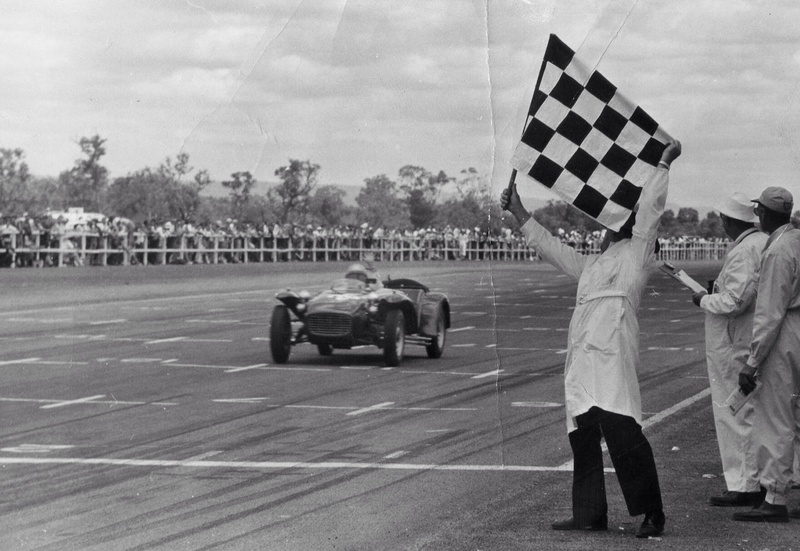 Tim Joshua’s unique single-seater, supercharged four-cylinder Gough powered Frazer Nash cannot have been in the country too long with the Bryant & Mays Matches family member a guy who always drove well. This huge factory complex (hard to believe how big a factory it was/is just to make matches) off Church Street Richmond, Melbourne is well known to locals in restored form and was unfortunately the property redevelopment which all but financially destroyed Porsche Cars Australia’s Alan Hamilton in the late eighties. It wasn’t the ‘Nash first meeting though, he raced it in the SA GP at Lobethal in January. 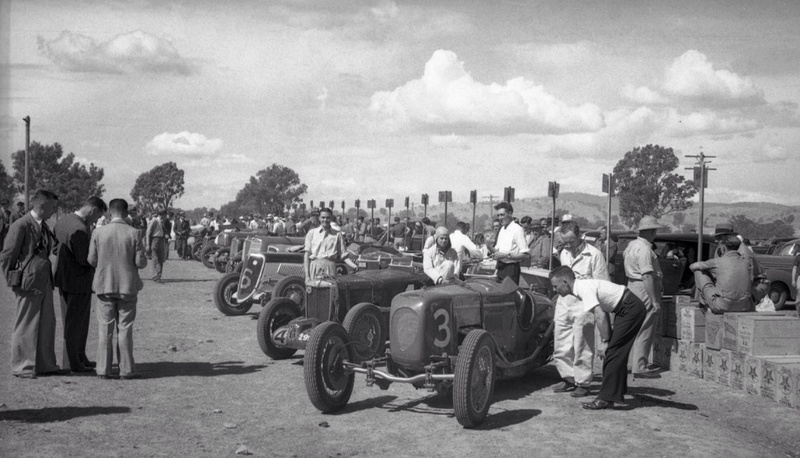 The car, number #3 above is in the Wirlinga paddock alongside Hope Bartlett’s MG Q Type and the Jack Phillips/Ted Parsons #6 victorious 1934 Ford V8 Spl. 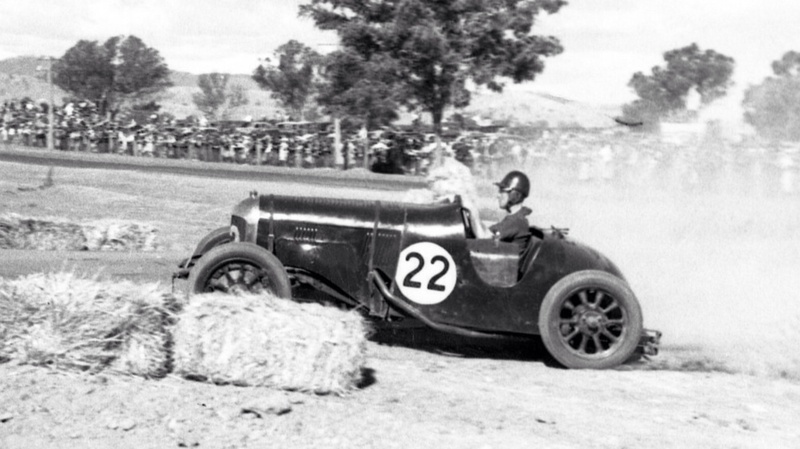 Other cars of note are perhaps the D Souter MG P Type driven by Colin Dunne who was fresh from a great win in his own MG K3 in the Junior Grand Prix at Lobethal. No doubt Dunne took this drive to preserve his own K3 for the forthcoming AGP. Others were Jack O’Dea, MG P Type, Jim Boughton in a Morgan 4/4 Coventry Climax and Barney Dentry’s Riley Spl. 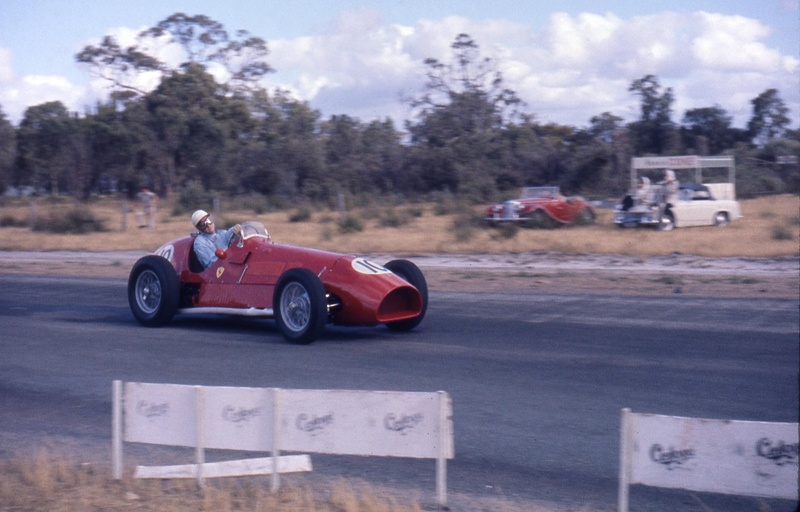 Of an entry list of 25 racers, thirteen or thereabouts are ‘factory cars’ with the balance Australian Specials- these cars would increasingly form the most significant numbers on our grids until the dawn of the fifties when the end of Australian Grands Prix run to handicap rules forced those after victory to acquire a car which could do just that on an outright basis! Sesquicentenary festivities in Albury were well underway by the time the Governor of Victoria, Lord Wakehurst alighted the train from Melbourne and performed the formal opening ceremony for the week on Tuesday 15 March in the Albury Botanical Gardens. On raceday, Saturday 19 March, some 6,000 to 10,000 spectators attended the meeting from towns far and wide across South Australia, New South Wales and Victoria- good train access allowed the punters to make the long distance trip from the major population centres of Sydney and Melbourne relatively easily. 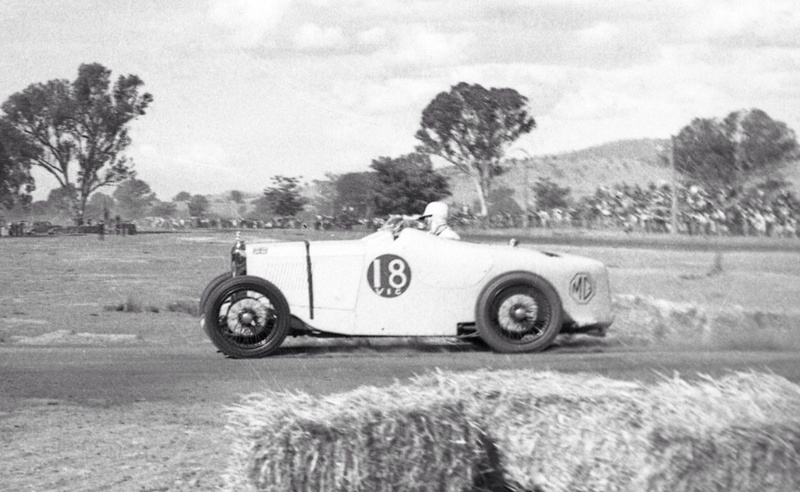 Jack Phillips won the race (below) driving his 3.6 litre Ford V8 Special from George Bonser’s Terraplane 8 Spl and Les Burrows aboard a similar Terraplane 8 Spl. Phillips, accompanied by his business partner and co-owner of the car, Ted Parsons, covered the 150 miles in 2 hours 13 minutes and 15 seconds, an average of about 67 mph. The two friends were partners in a Ford sales and service agency in Wangaratta, a major centre of agriculture to the south-west of Albury in Victoria, it was very much a hometown win all the same. So successful was the meeting that the ‘Albury Banner and Wodonga Express’ correctly predicted that the race would become an annual event- for a while at least until the outbreak of war. Unfortunately the only scratching from the event was Allan Sinclair in his Alta with gearbox failure, the unreliability of this car was to be one of its hallmarks in his hands. Phillips was the only driver to have a trouble free run, and when other competitors either dropped out or made multiple pit stops he was able to take the lead on lap 23 of the 33 laps. At that stage McDonald, Standard Spl was in front but he had mechanical problems and withdrew. Early DNF’s were Evans having completed only 2 laps- and Kleinig’s Hudson Spl, Bartlett MG Q Type, Beith Terraplane, Lea-Wright Terraplane, Wrigley MG Magnette, Boughton Morgan, Aitken Riley, Dunne MG P Type, Barrett Morris Cowley Spl. Frank Kleinig’s Hudson effectively became the scratch-man with Sinclair’s withdrawal and was rightly regarded as one of the favourites for victory. The press-on Sydneysider recorded the fastest lap of the 4.25 mile track with a 3 minute 26 seconds time but the Hudson had trouble early on and after multiple pit-stops he called it quits on lap 10. Barney Dentry, Riley Spl winner of the 50 Miles Race at Cowes in November, was well up until he too pitted for repairs to his Riley. 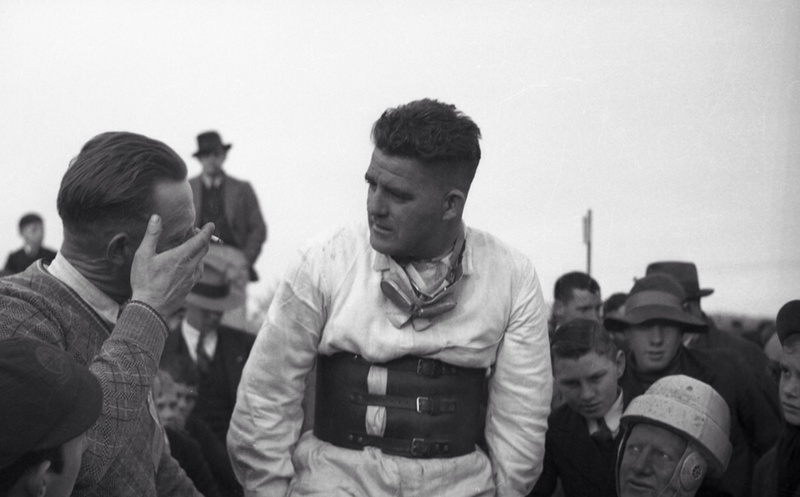 Dentry provided one of the thills of the race when he challenged Arthur Beasley’s Singer on the Main Straight and passed him for fifth place only 150 yards from the end of the race. Plenty of excitement was provided by the crowd ‘the largest that has yet assembled at a sporting event in Albury’. ‘Close on 6,000 people thronged the huge grandstand and on either side of the road near the finish line. The crowd got out of control when the last stages of the race were being completed. Despite the repeated entreaties to refrain from crossing over the road, people surged from one side to the other in droves, right in front of fast moving cars. However there were no accidents’ the Albury Banner reported. The winning Phillips/Parsons Ford, a 1934 model, was modified in the manner typical of the day. The 4 litre Ford flathead V8 was fitted with dual carburettors sitting atop an aluminium inlet manifold, a Winfield camshaft, an enlarged sump, oil cooler and double radiators were incorporated. A contemporary report says that ‘Phillips had a remarkable run of good luck in this race compared with other events he competed in’. Clearly the two boys from Wangaratta were entering a purple patch with the car because they soon thereafter had a great run of results. 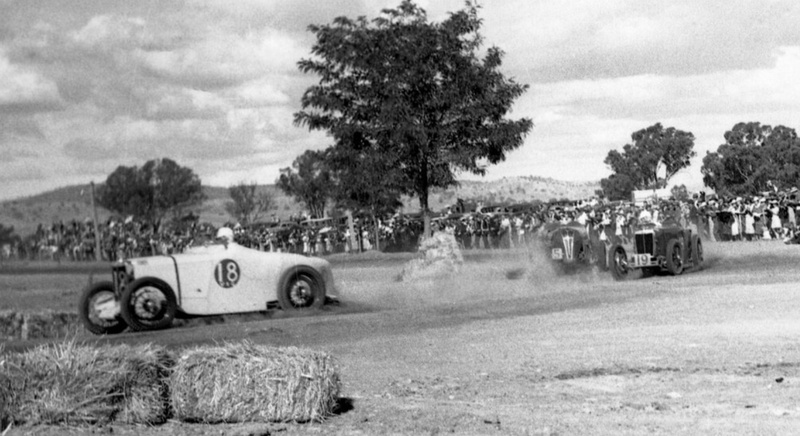 After Wirlinga the intrepid duo towed the Ford to Bathurst at Easter where they were sixth in the 1938 AGP won by Peter Whitehead’s ERA- and then third in the January 1939 AGP at Lobethal, that race won in brilliant style by Perth’s Allan Tomlinson in an MG TA Spl s/c. 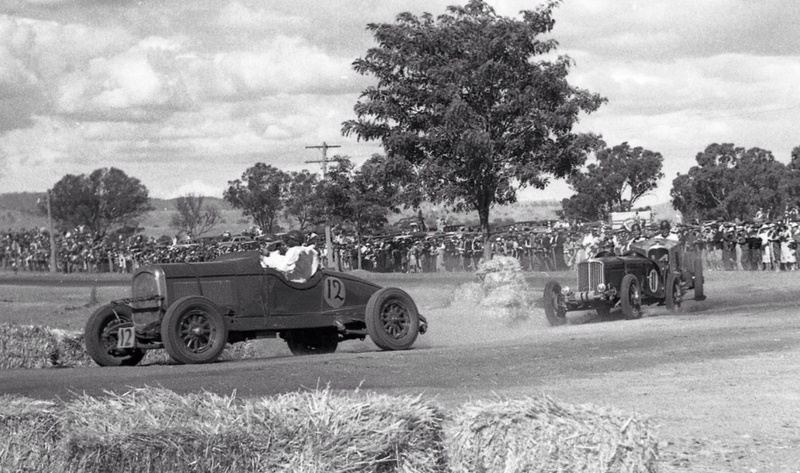 Returning home they ‘doubled up’ and won the 1939 Albury Gold Cup at Wirlinga in July, they didn’t take the win in the 1940 event, the last motor race held at Wirlinga. 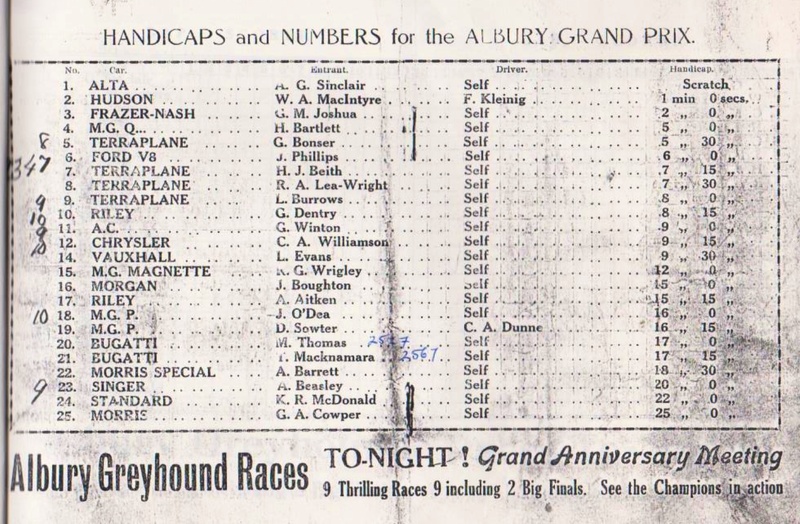 Back across the border to Lobethal they won the 1940 South Australian 100, and that was pretty much it until the end of hostilities, Patriotic GP at Applecross in Perth held on 11 November 1940 duly noted. Whilst much is rightfully made of Doug Whiteford’s Ford V8 Spl, ‘Black Bess’, its best results were still to come, perhaps this is the most successful Ford V8 Spl pre-War? After the conflict the beast was sold twice, then crashed and written off in the late forties- a lovely replica built by Ted Parson’s grandson in recent times will have been seen by some of you. Phillips, in covering the 150 miles in 2:13.15 also did the fastest time of the race, his average time for each lap was 3:50 compared to Kleinig’s fastest lap of 3:43. At an average speed of 67-69 mph Phillips was about a lap ahead of Bonser’s Terraplane who was a similar distance ahead of Les Burrows Terraplane. Then followed George Winton AC, Dentry’s Riley, the Beasley Singer, Williamson’s Chrysler and O’Dea’s MG P Type. The teams prize went to Burrows, Bonser and Kleinig. 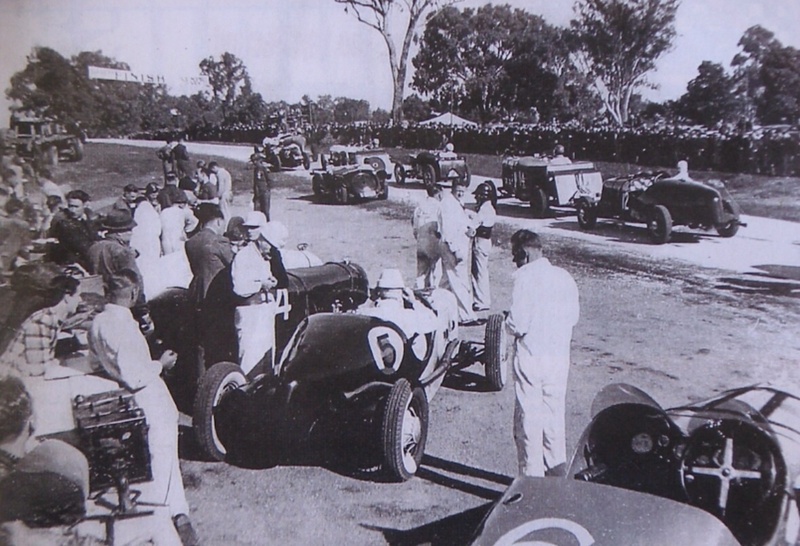 Pit and paddock scene from the final Wirlinga meeting over the Kings Birthday weekend, 10 June 1940. 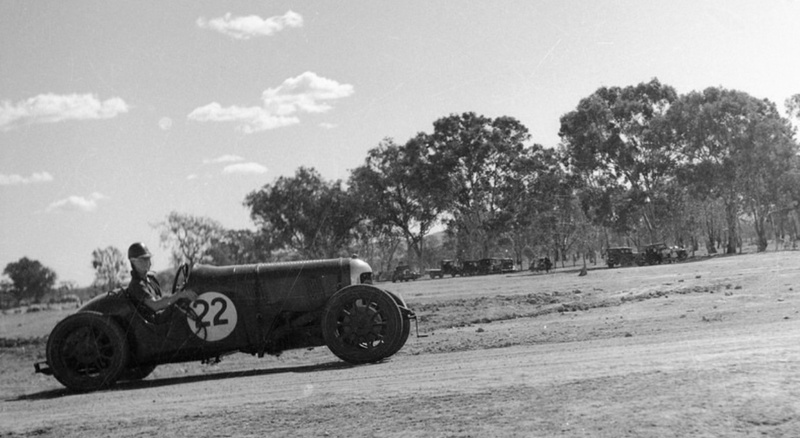 The Interstate Gold Cup was won by Harry James’ Terraplane with the lap record for all time as it turned out, set by Alf Barrett’s Alfa Romeo Monza at 89 mph. 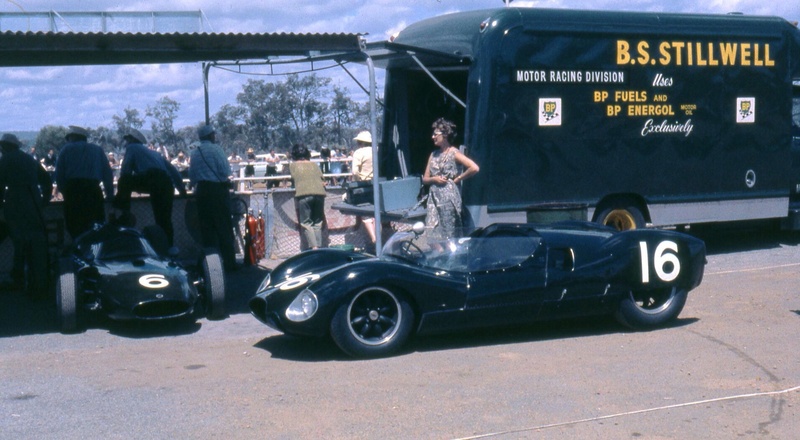 I wonder if that is Barrett’s Monza to the left of Jack Phillip’s Ford Special #5 in the photo above? 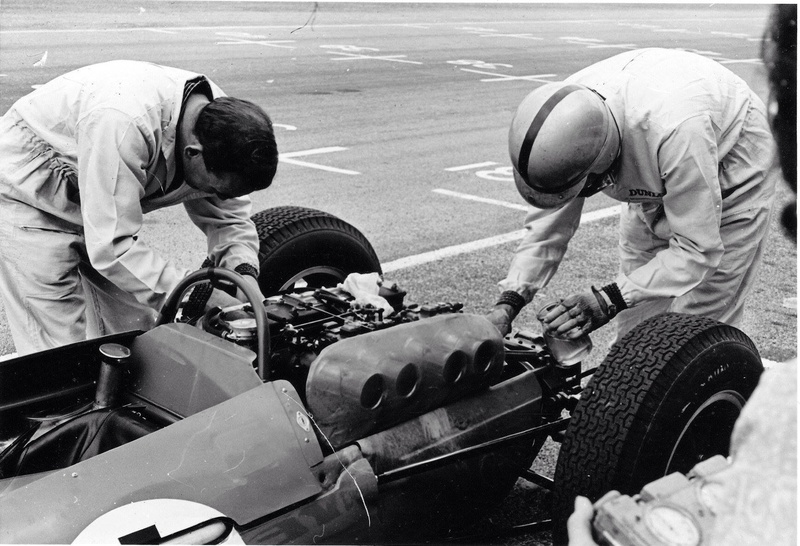 Alf Barrett applies a touch of the opposites to the wheel of his Morris Cowley Spl- the power of the supercharged GP Alfa which replaced this machine, capable of a 90 mph top speed, must have been considerable, not to say every other aspect of the cars performance! Raced in a couple of AGP’s in Colin Anderson’s hands- he raced the car at Bathurst in April to 12th place whilst Barrett’s Lombard AL3 retired after completing only 3 laps, I’m not sure what became of this highly developed 1.7 litre attractive Morris or who built it in Melbourne. Jack O’Dea’s beautiful MG P Type in profile. Some modern online accounts have Les Murphy driving the car at this meeting but neither the entry list or race accounts i have seen make mention of the AGP winner at the wheel. The K McDonald ‘Flying Standard Spl’ is not a car I know anything about, I am intrigued to understand who built it and it’s specifications if any of you can oblige. Jack O’Dea’s MG P type leading the scrapping duo of Colin Dunne in Souter’s MG P and George Bonser’s Terraplane Spl. Jack Phillips with kidney belt to keep his gizzards under control with helmet wearing Ted Parsons alongside- who is the dude on the left I wonder? The other cars shown are the Warwick De Rose Lotus 11, having difficulties with one of his doors, and the John Sheehan Geneer Outlaw VW at the rear of the group. Australian Formula Vee enthusiasts will recognise CMS and Geneer as Melbourne constructors of Vees. I was aware of the Outlaw sporties, attractive little cars, but not that CMS made beach-buggies- which were big at the time constructed on shortened VW chassis’. Maybe Janey, with a short set of ratios in his Hewland DG300 would have seen 130 mph at the Weir but no way the CMS would do 80, so the closing speeds and differential of pace are not to be sneezed at. In any event, it’s a cracker of an amusing shot of a time and place long ago. The Geneer’s were built by Barry Coutts in East Burwood, not too far from where I used to live, about 15km to Melbourne’s east. About 30 are thought to have been constructed between 1960 and 1967 with a range of VW, and the occasional Porsche engine inserted in the rear of the multi-tubular spaceframe chassis. Very interested to hear from an owner. This is about as natural a setting, devoid of signage and the visual clutter typical of racetracks by the early seventies you could hope for to capture surely one of the most beautifully proportioned and delicately toned Touring Car racers ever? Foley’s ex-works car in its various incarnations is very well known to Oz enthusiasts, I’ll get around to writing about it again one day- I first did so in an Alfa Romeo Owners Club of Australia magazine circa 1978! About time to do so again, thankfully the car is still in Australia, in Melbourne’s east and in the very best of Alfista hands too. Eoin Young, journalist and author of considerable renown, Wally Willmott, mechanic of similar standing, the incomparable Bruce McLaren and Cooper T62 Climax at Styles Garage on the corner of Sussex Street and the Albany Highway, Victoria Park, Perth during the 18 November weekend. The Austin has a 15 kilometre tow from this inner south-eastern Perth suburb to Caversham now also a Perth suburb in the Swan Valley. All so simple isn’t it, three blokes and a car?! 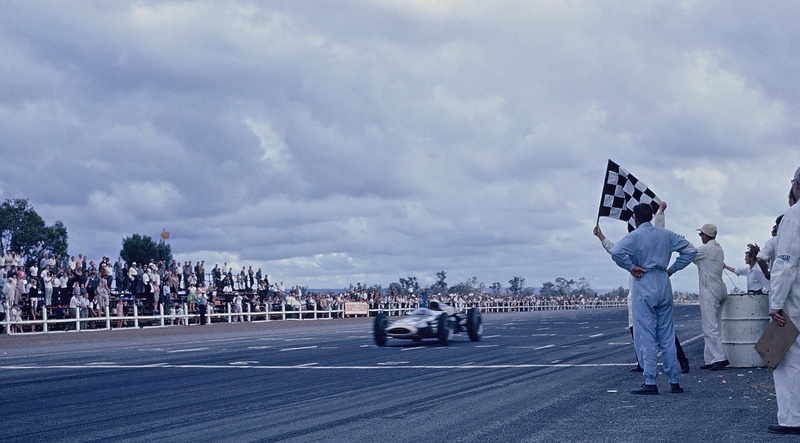 And they won the race- with a little bit of luck thanks to Jack Brabham’s late race collision with Arnold Glass, but that in no way diminishes the achievement. Here are a few more brilliant photographs from Ken Devine’s Collection of that weekend- I was going to retro-fit them into the old article but it seems better to let the photos ‘shine on their own’ so here they are with a few supporting notes. 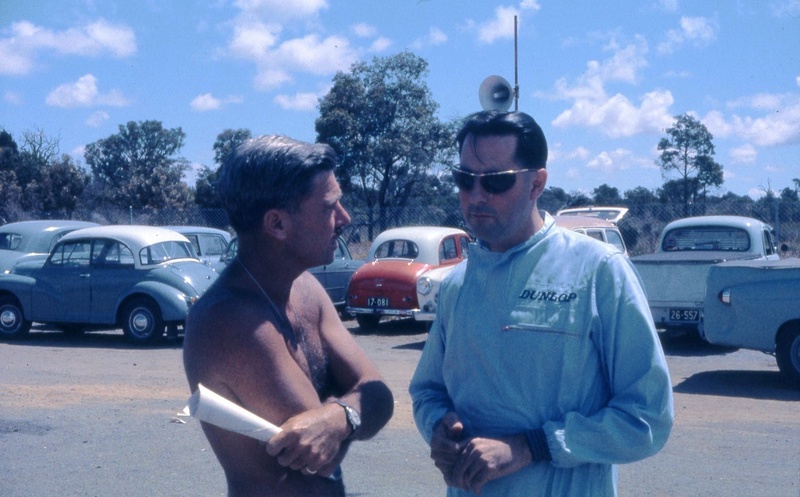 David McKay and Jack Brabham chewing the fat- don’t they look like youngsters?! McKay didn’t race that weekend but was scooping up information for his newspaper and magazine reports of the race. Morover he was spinning Jack a line about how long-in-the-tooth his Cooper was and how much he would like to buy Jack’s brand-spankers BT4 Climax- a feat he would accomplish! The BT4 was in essence an FPF engined BT3- Tauranac’s first, 1962 F1 car. 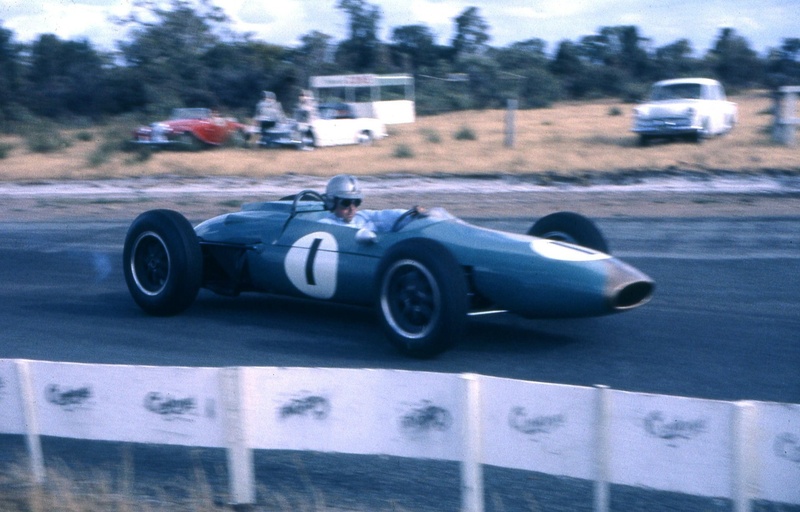 Jack raced the car in New Zealand (a win at Levin) with David racing it in the Australian events- Graham Hill took the wheel in the 1964 Tasman Series achieving one win at Longford. Lex Davison looking stern as he motors past at some clip in his T53 Cooper- like McKay he was after a new car too- at the end of the summer Bruce’s T62 was his, a car around which a good deal of tragedy occurred. Lex was classified 8th from grid 4 but only completed 46 of the races 60 lap, 101 mile distance. Bib Stillwell must have been flogging quite a few Holdens from his Cotham Road, Kew, Melbourne dealership by then- he really went about his motor racing in a thoroughly professional manner. To me he was slow to peak having started racing just after the war, but man, when he did he was an awesome racer taking four Gold Stars on the trot from 1962 to 1965- he had his tail up on this weekend as he had just taken his first Gold Star in this Cooper T53 Climax with wins in two of the six GS championship rounds. Its interesting to look at Stillwell’s results that year- he had an absolute cracker of a season inclusive of the internationals when the big-hitters were about. His record is as follows; Warwick Farm 100 3rd, Celebrities Scratch Race Lakeside 1st, Lakeside International 2nd, Victorian Trophy Calder 1st, South Pacific Championship Longford 3rd, Bathurst 100 1st, Racing Feature Race Calder 1st, Victorian Road Race Championship Sandown 2nd, Advertiser Trophy Mallala 1st, Hordern Trophy Warwick Farm 1st, AGP Caversham 3rd- it was a year of amazing speed and reliability, the teams only DNF was at the Sandown International (engine) the only other ‘non-event’ was a DNA at Lowood- by early June Bib no doubt figured the long tow to Queensland from Melbourne was a waste of money. 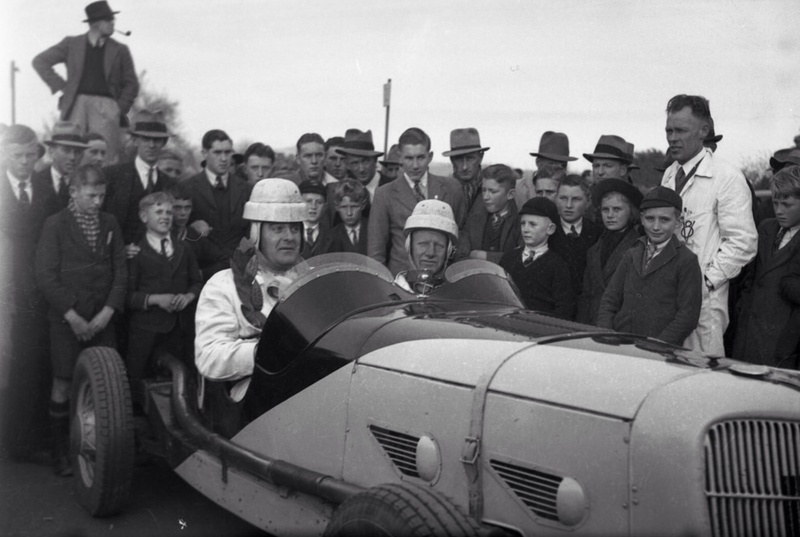 At Caversham Stillwell was third on the grid behind McLaren 1:19.6 and Brabham 1:20.1, Bib’s 1:20.3 was pacey- he finished third, 47 seconds adrift of McLaren and 5 seconds behind John Youl in a Cooper T55. Lets not forget the Cooper Monaco either- a car I wrote about a while back and which received the ex-Scarab Buick-Traco V8 a little later in its life- the motor which was in the engine nacelle of Arnold Glass’ BRM P48 (#7 below) this very weekend. The cut and thrust between Brabham and McLaren went on for over forty laps- Jack saw an opportunity when Bruce ran wide lapping Arnold- Jack focussed on Bruce, Arnold on taking his line for the next corner, a collision the result. Jack was out on lap 50 whereas Arnold survived to finish in fifth place from grid 7. 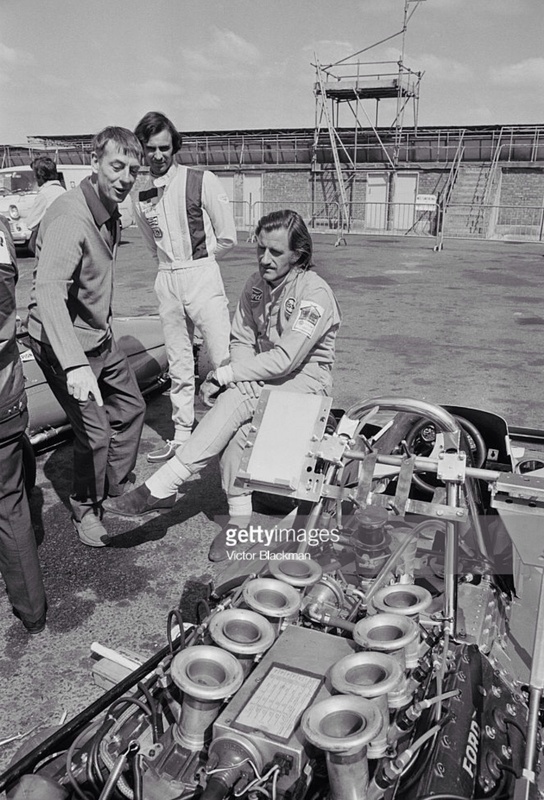 Jack and Roy fettle the 2.5 litre Climax engine lent to them by Bruce McLaren, Jack having popped his 2.7 ‘Indy’ FF in practice. The Brabham BT4 was the first in a long line of ‘Intercontinental’ chassis built by the Tauranac/Brabham combination all of which (BT4/7A/11A) won a lot of motor races in this part of the world. 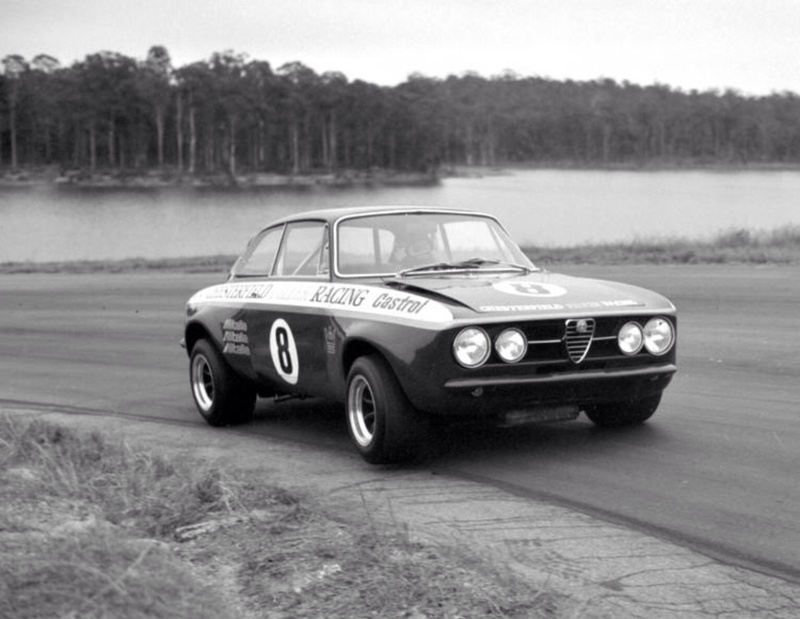 Paragons of practical, chuckable virtue the cars won races in the hands of World Champions Hill, Stewart and Brabham as well as championship winners in domestic competition for the likes of Stillwell, Spencer Martin and Kevin Bartlett (whilst noting the latter’s Gold Star success was aboard a BT23D Alfa Romeo. Plenty of hopefuls entered the meeting not least Jim Harwood in the ex-Whitehead/Cobden Ferrari 125 which by then was fitted with a small-block 283 cid Chev V8. 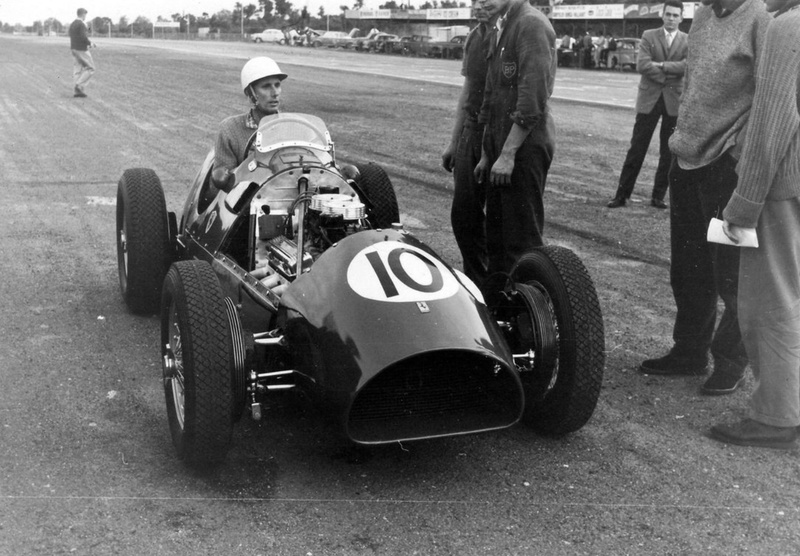 His times were too far behind the modern mid-enginer racers of the top-liners so he elected not to start- with 1962 still just into the period of Austraian motor racing where everybody could have a go with a high-born special such as this ex-GP 1950 Ferrari. The car is notable for the fact that it was one of Tom Wheatcroft’s first Donington Collection acquisitions. Brabham, Stillwell and McLaren from left to right at the drop of the starters flag. 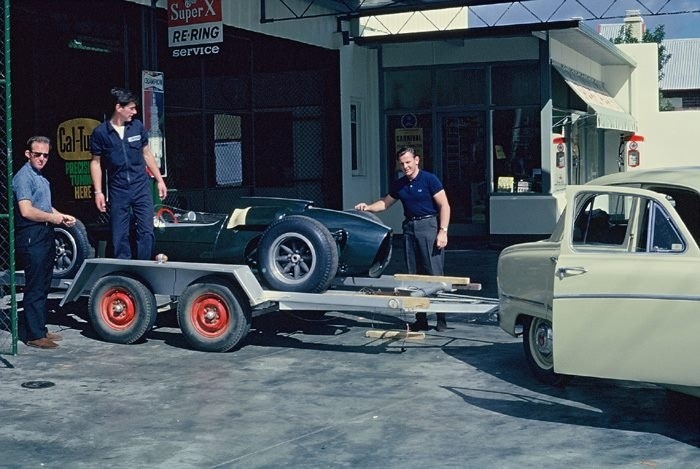 Brabham BT4, Cooper T53 and Cooper T62 respectively. On the second row its John Youl at left, Cooper T55 and Lex Davison’s red T53 alongside him. 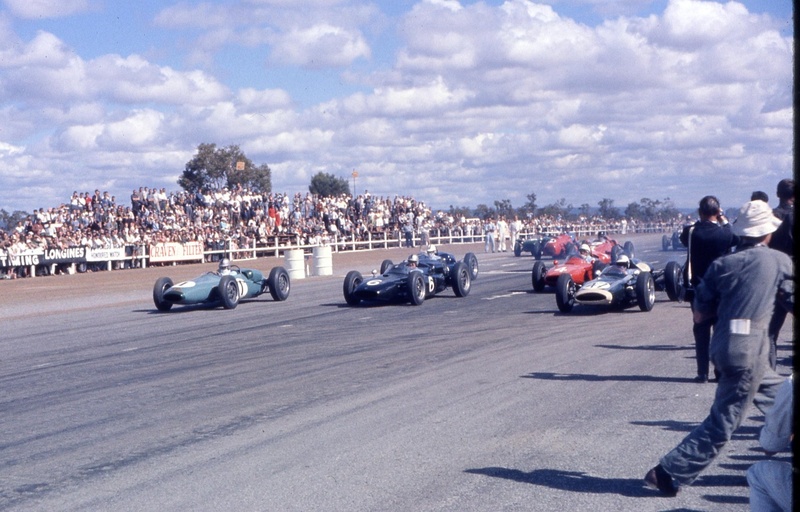 In the dark helmet on the row behind is the red with white striped BRM P48 Buick of Arnold Glass and at very far left is Jeff Dunkerton’s Lotus Super 7 Ford 1.5- to the right of the Lotus is the red front-engined #14 Cooper T20 Holden Repco of Syd Negus. Whilst ten starters is not a big grid, Dunkerton’s achievement in finishing ninth in the little Lotus 7 was an amazing one- the last placing ever gained by a sportscar in an AGP. 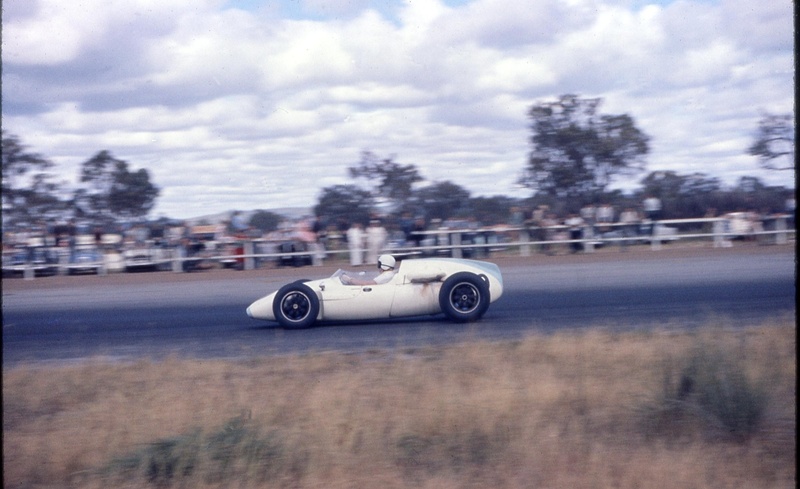 Bill Patterson was the reigning 1961 Gold Star Champions but his old Cooper T51 was never going to be a competitive tool going into that year with plenty of more modern well-driven machines on Australian grids. In reality Patto was easing himself slowly out of racing as a driver albeit he would remain involved as a sponsor/entrant in the next couple of decades. He started from grid 6 and finished fourth albeit three laps behind McLaren. John Youl is another driver I’ve waxed lyrical about in the past- its a shame commitments running the family pastoral properties in northern Tasmania took him away from motor racing. Youl’s ex-works Cooper T55 was beautifully prepared by Geoff Smedley and pedalled very quickly by John in the 1963 Internationals. It would have been very interesting to see just how far he would have progressed up the elite level totem-pole had he stuck with his racing career. Bruce on the way to a Caversham win, Cooper T62 from Youl, Stillwell, Patterson and Glass. Bruce McLaren Motor Racing had rather a bright future. Is it Jack in the blue driving suit obscuring the man with the flag? 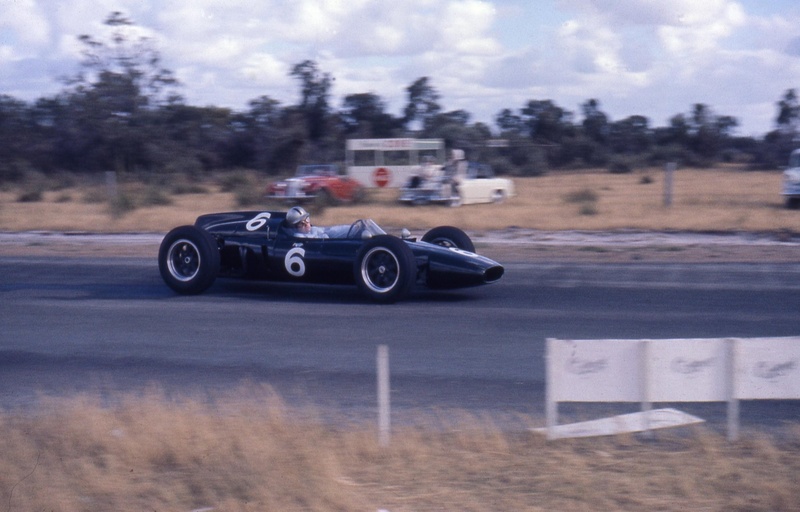 Bruce won two AGP’s, the other aboard his self designed and built- with Wally Willmott, Cooper T79 at Longford in 1965. 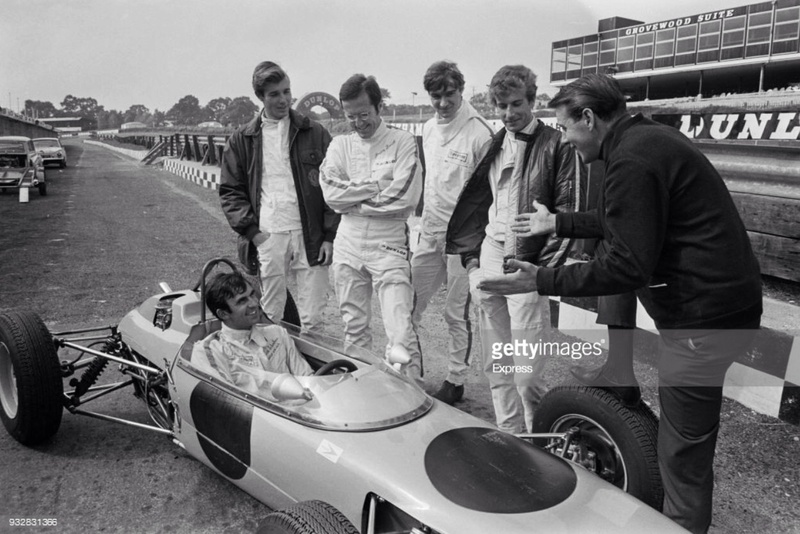 Chris Steele, Tim’s tuner/entrant dispenses advice to the Formula Ford ‘flock’ comprising Ray Allen, Brian Smith, Dave Morgan and Tony Trimmer. No doubt it’s a press shot to promote an upcoming race meeting; two of these fellows made it through to Formula 1- Schenken and Trimmer, the well of talent in Formula Ford has been deep in every season including its first couple. 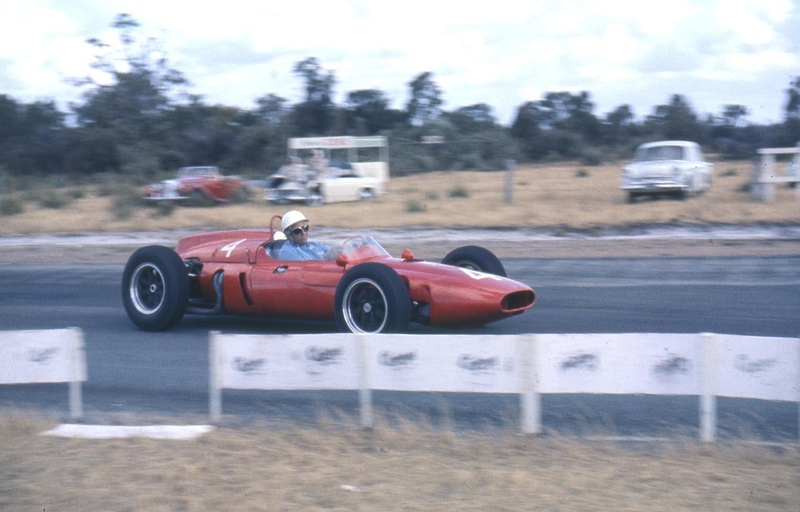 Schenken cut his racing teeth in Australia, initially with an Austin A30 and later a Lotus 18 Ford FJ. 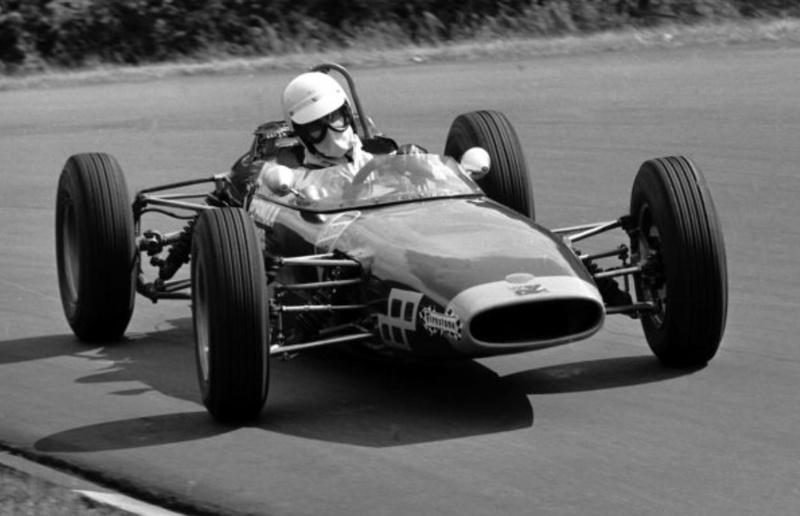 By the time he contested some F3 races in an old Lotus in the UK in 1967 he had plenty of experience- the step ‘back’ into the new Formula Ford class paid off in spades with wins in both the 1968 British Formula Ford and Lombank F3 Championship- as a consequence he carried away the main 1968 Grovewood Award. In 1970 he broke into Grand Prix Racing with Frank William’s De Tomaso 505 Ford, that ride arose as a result of Piers Courage’ death during the 1970 Dutch Grand Prix. His promise was confirmed with drives in the year old Brabham BT33 Ford for Ron Tauranac in 1971, his first career mistake was jumping out of Brabham as BC Ecclestone acquired it at the end of ’71. Surtees was far from the worst place to be at the time but staying put would have been better. Tim was as quick as Mike Hailwood at Surtees but the slip down the F1 totem pole was quick once he left and the climb back up is even harder. I don’t think we ever saw his best in Grand Prix racing but point scoring races and an F1 podium, not to forget his F2, European GT Championship and works Ferrari 312PB sportscar wins form part of a CV any of us would be rather happy to have. 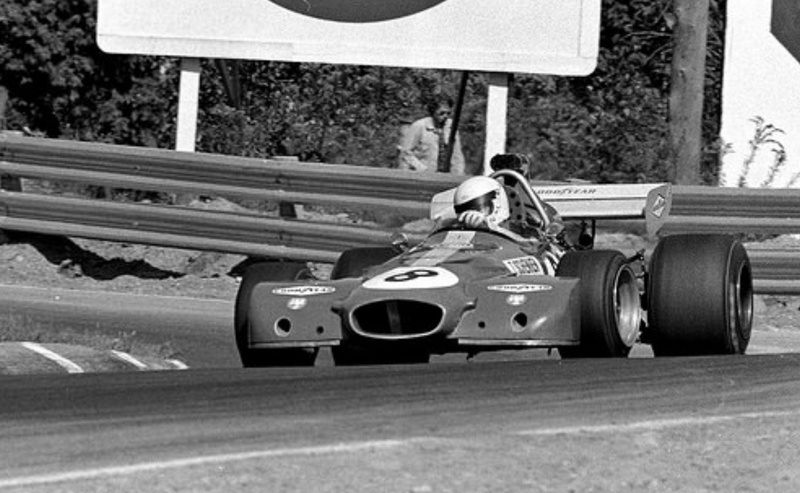 Tim’s best results in F1 were sixth and third placings for Brabham in 1971 at Hockenheim and the Osterreichring and fifth, seventh and eighth for Surtees in 1972 at Argentina, Mosport and Spain. 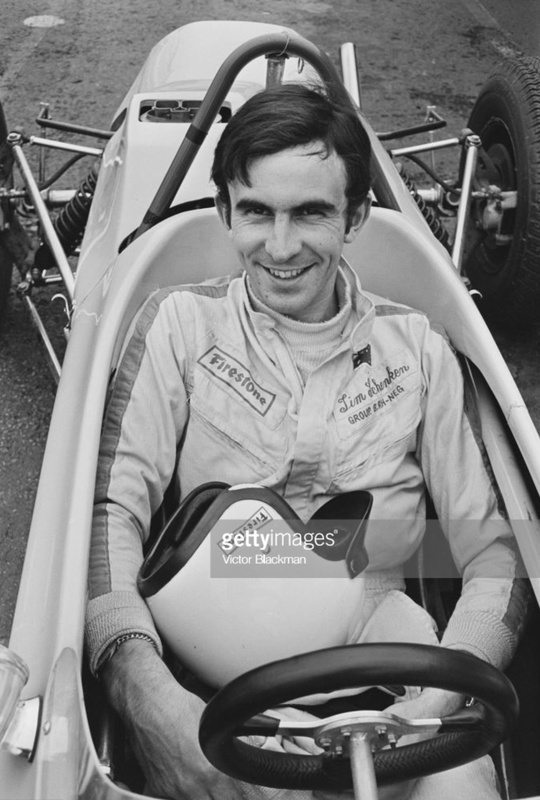 In non-championship F1 he was third in the BRDC International Trophy at Silverstone and third in the 1972 International Gold Cup at Oulton Park.